Every business owner needs to get their head around laws and regulations. Colleague rights, health and safety, and even confidentiality are all crucial. Failure to comply with these could damage your staff efficiency, and even lead to legal action. If that happens, you would be out of pocket in a significant way. Most managers know this, and take the necessary action to avoid it. But, these basics aren’t the only legalities to consider. There are also rules against any kind of discrimination. That includes disability. Thanks to the American Disabilities Act, everyone has a right to work. As an employer, you can’t disregard someone because they’re in a wheelchair, or use a walking stick. More than that, you have to provide a workplace which is easy for such individuals to manoeuvre. To make sure, do your research, and find out about ADA contractors who can help you make necessary changes. In no time, you’ll have a disability-friendly workplace. To help, we’re going to look at some of the ways you can achieve that goal. Many workplace elevators fall into disrepair. But, you have a legal obligation to ensure that you have a working elevator at all times. You can do this by getting yours serviced often, and also making an effort to keep it clean. This is particularly essential if large parts of your office operate on an upper level. By failing to provide a working elevator, you exclude wheelchair-bound workers. And, in case you hadn’t guessed by now, that’s discrimination. Image Source If, for whatever reason, your elevator does break down, contact a repair company. Don’t put the job to the back of your list and carry on. Sort it, and sort it fast. It’s also crucial you provide wheelchair friendly ramps within your workplace. Most importantly, you need these by every entrance. You should also place a ramp over any steps, or other obstacles a wheelchair would struggle with. In keeping with Disability Act regulation, the ramp incline should have a slope of 1:16 to 1:20. It’s also crucial you provide disability parking. Choose at least one space close to each entrance for disabled employees. You should make this clear by using the universal disability symbol. You also need to ensure other employees don't use that space when they shouldn’t. And, of course, it’s important to provide plenty of space within the work area itself. This is worth your attention at the best of times. A spacious office will boost productivity and staff happiness. But, narrow gaps between desks would be impossible for wheelchairs to pass through. Make sure to pay attention at all times to how wide your office corridors are. Guidelines for disabled door access recommend 36 inches. It’s worth applying this to your office space as well. Think, too, about the area provided underneath your desks. If a wheelchair would struggle to fit, you can rest assured they aren’t wide enough. It's important to be inclusive and compliant in your workplace as much as possible. Now you need to ramp up your efforts to ensure wheelchair access to your office and workplace. 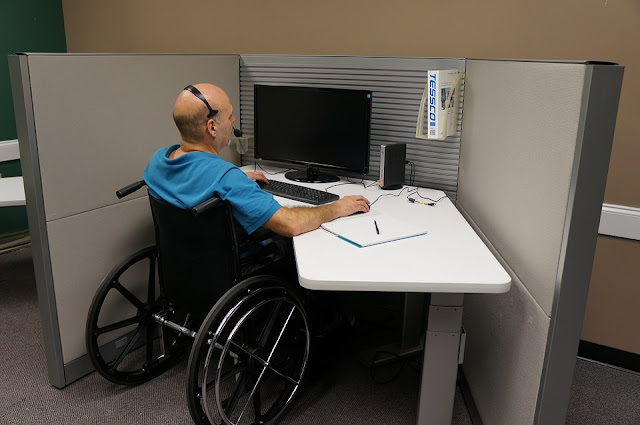 I hope you enjoyed this article about how to maximize disabled employee, customer, and client accessibility at your company.